VBS Direct Ltd - LifeWindow Monitors - Innovative solutions for the veterinary professional. The LifeWindow™ series of multi-parameter veterinary specific monitors are recognised as the best available on the market. LifeWindow™ monitors are robust in design and use state-of-the-art technology in their measurement modules. Devices (not LifeWindow One) can connect to your network/internet to allow parameter reporting via computer or mobile device. Works in specific environments that require the best technologies (such as exotic or magnetic resonance imaging). 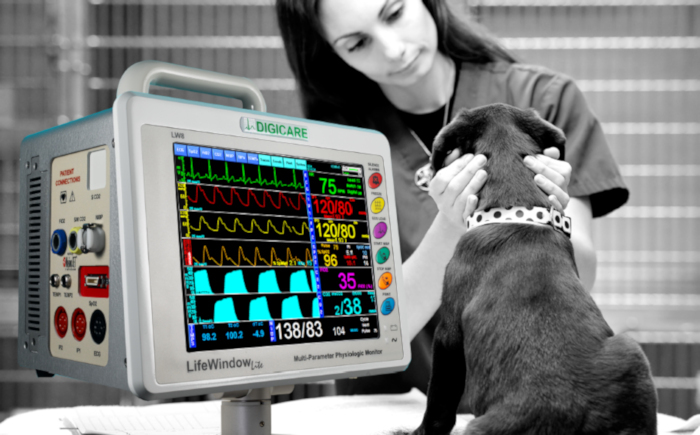 The LifeWindow™ series are the best veterinary monitors on the market for both patient safety and customer satisfaction. The LifeWindow™ series of monitors is the most precise and robust available on the veterinary market. Veterinary specific modules, unlike most of our competitors this monitor is not from the human market. (ex. Does not use neonatal parameters to measure small animals), able to work with small size animals, exotic, birds, etc. (ex, rodent’s module, ECG up to 999 BPM -maximum in the market). Also, can be used on very large animals with a minimum heart rate of 10 BPM). Simple Touch Screen. Calibrated to read from Equine to Hamster or Budgie blood pressure and ECG. Gold Standard Masimo Sp02 and Capnography, Suntech Blood Pressure, Oesophageal and Temp ECG tube. Premium Measurement Modules for all parameters, Masimo in SpO2 (With perfusion index, that allows to ensure if the clamp is well placed and measures correctly and possibility of incorporating PVI -pleth variability index- to know the level of hydration of the patient) SunTech in NIBP (these technologies are not included, only in specific monitors). Able to use 2-4 IBP channels, 2 temperature channels, side/main/dual stream in capnography, etc. Excellent for research, up to 4 channels of IBP and calculation of cardiac output (Life Window 9) Collaboration with a large list of universities. Highly Competitive against other monitors in our segment.